The liver health panel measures a wide range of blood markers related to liver health. What is the liver health test panel? The liver health test checks for liver health using blood markers. Why is the liver health test panel important? The liver health blood test checks for liver disease and infections. This Liver Health Panel is a blood test. The liver health panel tests a variety of markers related to liver health. This liver health test panel includes the tests found in the hepatitis A, B and C panel - hepatitis A IgM antibody, hepatitis B surface antigen and the hepatitis C test. This liver function panel also includes LFT blood test, hepatitis A total antibody test, and the hepatitis B core antibody test. To get a liver health panel near you, order online and get tested at the Quest Diagnostics lab that you selected. Once your liver health panel results are ready, you will be able to download them. 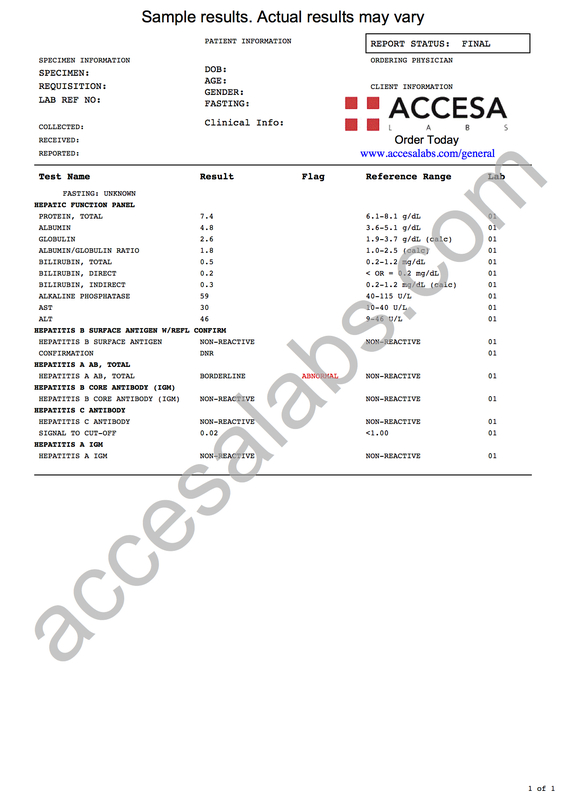 As can be seen on the sample liver health lab report above, the individual liver components of the panel will be reported and can be compared against the reference ranges provided by the lab. Liver Health Panel at Guaranteed Prices.